It’s all come down to this – the Highly Unofficial picks for the best fighters of 2017. As always, the rule is that someone had to have fought at least twice to be considered for the list, but with so many shows, what used to be an issue is an issue no longer, as there were plenty of top performers showing what they do best in the Octagon. In a year in which any of the top five on this list could have snagged the top spot, I made the tough call to name Mr. Holloway the Highly Unofficial UFC Fighter of the Year for 2017. Winner of a pair of fights over Jose Aldo that established him as the top 145-pounder in the sport, it was the method of the Hawaiian’s wins that impressed and the reality that those victories came over the best featherweight in history, one whose only bad night in the pre-Holloway decade was against Conor McGregor. Currently sporting a 12-fight winning streak, Holloway may one day take that unofficial best ever crown from Aldo if he stays on the track he’s on. Hey, it is what it is. We had that all-time great conversation twice already on this list, and when it comes to Demetrious Johnson, there is no debate or what ifs. “Mighty Mouse” will go down in the history books as one of the best to ever do it, and in 2017, he added to that legacy with a pair of submission wins over Wilson Reis and Ray Borg, the latter victory putting the flyweight boss all alone at the top of the list for most successful title defenses in UFC history. 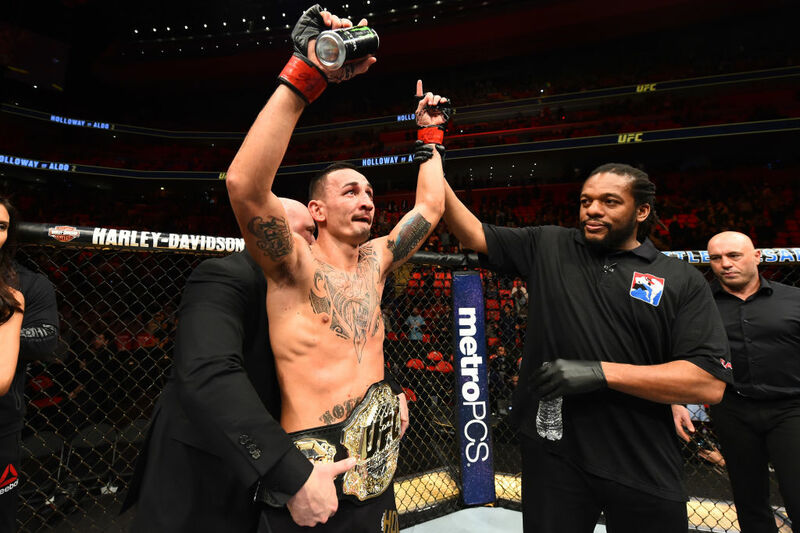 There is no longer the “interim” tag on Robert Whittaker’s middleweight title, and that’s a good thing, because “The Reaper” from Down Under earned his 185-pound crown the hard way, stopping Ronaldo “Jacare” Souza in two rounds in April before winning the interim belt with a hard-fought win over Yoel Romero in July. In February, Whittaker, who was elevated to full champion when Georges St-Pierre vacated his crown, defends his title for the first time against Luke Rockhold. Long considered the top female fighter in the game, Cris Cyborg finally arrived in the UFC in 2016, and in 2017, she hit the top of the featherweight division when she stopped Tonya Evinger to win the vacant crown. In December, she closed out the year with a decision victory over Holly Holm in a long-awaited dream fight, achieving the worldwide acclaim she has fought for years to get. The UFC Newcomer of the Year, Switzerland’s Volkan Oezdemir entered the Octagon for the first time on short notice, and by the end of the year, he beat a trio of contenders – Ovince Saint Preux, Misha Cirkunov and Jimi Manua – and earned a shot at the light heavyweight title. And if he defeats Daniel Cormier at UFC 220 in a couple weeks, call that a good start on earning 2018 Fighter of the Year honors. After losing his UFC lightweight title to Eddie Alvarez and dropping a subsequent bout to Tony Ferguson, some considered Rafael Dos Anjos’ decision to move to welterweight a desperate move, not a smart one. Those folks aren’t saying much anymore, as RDA may have put himself in line for a shot at the 170-pound belt with a pair of impressive wins over Neil Magny and Robbie Lawler that have shown the Brazilian to be more vibrant than ever in his new weight class. If not for a controversial no contest against Eddie Alvarez in a fight he looked to be winning, Dustin Poirier could have nabbed a top five spot here. But even with that result, Poirier was in top form in 2017, winning Fight of the Night honors in his two victories over Jim Miller and Anthony Pettis. The quiet man of the UFC, Raphael Assuncao wasn’t chasing Twitter followers or issuing incendiary sound bites. He just showed up to fight three times in 2017 and went on to decision top bantamweight contenders Aljamain Sterling and Marlon Moraes before knocking out Matthew Lopez. In other words, it was another year at the office for one of Brazil’s finest exports. One of the most dangerous competitors in the game, Brian Ortega mixes talent with a willingness to get into a fight and the result is a young man who is rapidly closing in on a title shot at 145 pounds. In 2017, Ortega went two for two with a pair of guillotine choke victories over Renato Moicano and Cub Swanson that earned “T-City” a combined three post-fight bonuses.